Behind every great couple is a great story-and so it is for Bill and Louise Temte who will celebrate their sixtieth wedding anniversary in 2018. Approaching such a milestone has given the couple time to reflect and to be grateful for their blessings: a happy family, successful careers, and excellent healthcare that has allowed them to pursue their passion for music even as they advance in age. In 1957, Louise Adkins was living with her family in Biloxi, Mississippi. Since her dad was a military man, the family had moved around a lot-from Nebraska (where she was born), to Illinois, and finally, to Mississippi. One thing that made adapting to frequent change easier for young Louise was her passion for music. She spent hours playing the piano that her parents had purchased for her when she was just 8 years old. As a teenager, she shared her talents by serving as an accompanist at Leggett Memorial Methodist Church. That same year, Louise met a handsome soldier who also had a passion for music-Bill Temte. A native of La Crosse, Wis., Bill had lost his father early in life. His mother worked three jobs to support the family, so at age 18, he joined the Air Force to study electronics. Years of singing in the Trinity Lutheran Church Choir back home had prompted him to join the Air Force Chorus, which performed at Leggett Memorial Methodist Church. There, a talented young organist soon caught his eye and captured his heart. "I was swept off my feet by this handsome airman with a beautiful voice," remembers Louise with a smile. "It was all pretty romantic." The pair married in 1958 and had their first child (Elizabeth) at Keesler Air Force Base before Bill finished his service and the family moved to La Crosse. There, Bill attended La Crosse State College (now University of La Crosse-Wisconsin) where he studied chemistry, math, and physics. Later, he went on to work at Coleman Technical Institute (now Western Technical College) as an instructor before eventually moving into an administrative position as the Vice President of Research, Planning, and Accountability. Bill also served the larger community through the La Crosse District School Board and as an elected official. In 1963 and 1966, the Temtes had two more children (Andy and Rachel) before Louise began pursuing her own education, attending Viterbo and then University of La Crosse-Wisconsin to earn a B.S. in Education (specializing in K-12 vocal music). In 1979, she began work at Trane, first as a typist and, later, as an in-house trainer. As the couple grew their family and established their careers, they continued to share a passion for music. Louise played the organ at several churches in town (including St. John's Reformed, First Presbyterian, and Christ Episcopal), served as an accompanist for the La Crosse Choral Union, and acted as a music director for La Crosse Community Theater. For his part, Bill sang in choirs for Trinity Lutheran Church, the La Crosse Choral Union, and the La Crosse Chamber Chorale, not to mention numerous barbershop quartets. He also enjoyed performing in musicals put on by La Crosse Community Theatre and Viterbo University. Since Bill had grown up in La Crosse, he was familiar with the options his family had for health care. His parents had always doctored at (what was then) Gundersen Clinic, and Bill had even followed the growth of Gundersen from afar in Mississippi. When it came time for the couple to choose a healthcare provider for their family, one visit to Gundersen was all it took for Louise to agree that Gundersen was the right choice. Just before arriving in La Crosse, Louise experienced swelling in her neck. Her doctor in Biloxi had diagnosed the swelling as a thyroid issue that could be treated with iodine drops. However, when she went to Gundersen to get her prescription for iodine drops refilled, that doctor immediately recognized the matter was more serious. "He examined me and told me that iodine drops would not help; he said that lump in my neck was cancer and had to come out," remembers Louise. Dr. Adolf Gundersen successfully performed the surgery to remove the mass, but the Temtes' relief was short-lived. The couple's insurance company denied the claim as a pre-existing condition, which left the couple with a financial burden. Empathizing with the young family, Dr. Adolf waived his own surgical fee to help make the cost manageable. In the end, Bill and Louise were not only grateful for Dr. Adolf's medical expertise and skill, but they were inspired by his compassion. "Dr. Adolf modeled personalized patient care, which is a quality that is now ingrained in the organization," says Louise. "Over the years, we've continually experienced that same kind of genuine care for our well-being. That's what sets Gundersen apart." In the 1990s, the couple moved to Sturgeon Bay, Wis., when Bill was offered a position as a dean at Northeast Wisconsin Technical College (NWTC) in Green Bay. There he also served as an Alderman, served as Chair of the United Way of Door County, and continued his work with the North Central Association of Colleges, an accrediting body for post-secondary schools. Louise became a contract trainer in the human resources field and traveled to many states. She also served as an adjunct instructor at NWTC teaching courses in supervisory management, leadership, and communication skills. When it came time for Bill to retire in 1998, though, the choice to return to La Crosse was an easy one. Not only could Bill work with his son, Andy, who had started his own business (known today as Kaplan Professional), but La Crosse also offered a community they knew with healthcare they could trust. "Through the years, I've had various medical needs, so I've acquired friends in several Gundersen departments-dermatology, internal medicine, orthopedics, neurology, urgent care, and more," smiles Bill. "In all my experiences, I have always felt that Gundersen uniquely provides not just 'healthcare' but 'people care.' The organization focuses on getting better-not just on getting bigger." For her part, medication and regular check-ups have helped keep Louise cancer-free for the past 57 years. She is further grateful that even as they approach their 80s, she and Bill can be as active as they want to be. "For some people our age, mobility is a real concern-a barrier-that keeps them from living the way they want to live," Louise explains. "But thanks to excellent caregivers, including the medical teams that have successfully replaced Bill's hips and my knees, our mobility is not in question." These days, "mobility" means Louise and Bill continue to be active in the community and enjoy musical pursuits. Louise serves as the organist at Our Savior's Lutheran Church (where she has played since 2005) and as the dean of the Riverland Chapter of the American Guild of Organists (AGO). Bill continues to enjoy singing and is an active AGO member, too. Together, they enjoy spending time with their musically-inclined children (daughters Beth and Rachel are accomplished vocalists and son Andy sings and plays guitar for The Remainders), as well as their grandchildren and great-grandchildren. 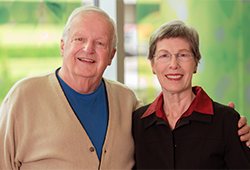 Nearly two decades ago, Bill and Louise were inspired by the care they had received at Gundersen and wanted to help ensure the organization's future. They began making regular gifts to Gundersen Medical Foundation and recently included the Foundation in their estate plan through a charitable bequest. "We are proud of the national recognition Gundersen Health System has received, and we're thankful to have had access to high-quality, innovative care. Supporting the Foundation, which helps support Gundersen Health System, is one way to say 'thank you' for the good health we've enjoyed," explains Louise. Additionally, shares Bill, the couple has chosen to support the Foundation because of what their gifts means for the future. "Simply put, we want to be part of ensuring continued access to high-quality healthcare for the next generation," he says. "The Foundation will use our gift where it is most needed and can make the greatest impact."